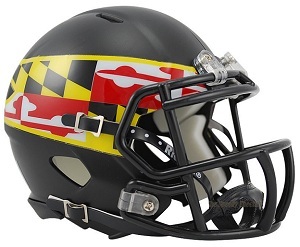 This is a full-size Authentic Maryland Terps XP Helmet by Schutt. 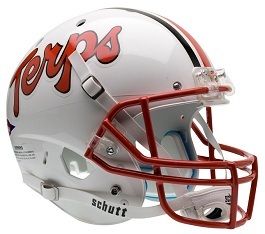 It features the streamlined AiR XP helmet shell, Official Terps helmet decals, a polyvinyl-coated steel facemask, 4-point chin strap and full interior padding. Great for autographs and display. Not to be worn or used for play. 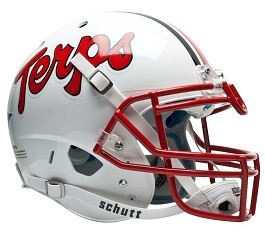 This is a full-size replica of the Maryland Terps XP Helmet by Schutt. 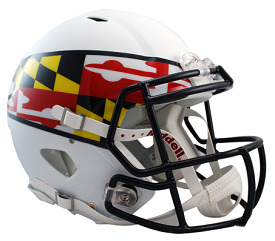 It features the streamlined AiR XP helmet shell, Official Terps helmet decals, a polyvinyl-coated steel facemask and 4-point chin strap. The Replica helmet does not include the full interior padding of the Authentic ... just the jaw pads. Great for autographs and display. Not to be worn or used for play.